EOL is directed by a committee of Lebanese Americans. The school projects and scholarships it supports are currently funded through Catholic Near East Welfare Association (CNEWA, a registered charity in the United States). We take an inclusive approach to helping educate children who are often overlooked — especially the orphaned, the disadvantaged and the disabled. On a project-by- project basis, EOL evaluates the needs of educational and child care institutions across Lebanon. CNEWA then distributes donor-contributed funds to ensure that vital projects thrive and scholarship monies are awarded. We help every child in need regardless of faith. It’s how EOL is helping educate a new generation — helping girls and boys build brighter, more hopeful lives. In today’s world, it is not unusual for the average person to feel helpless, with little ability to impact major events. Most Lebanese have experienced more than their share of helplessness. Since the civil war began in 1975, we’ve watched in horror as one tragedy followed another. Often our best and only contribution is to make donations for urgent needs and remain optimistic. 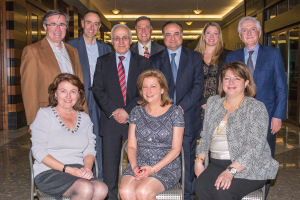 In the fall of 2006, after yet another war had taken place, a group of Lebanese-American friends began meeting in the Washington D.C. area to talk about what they could do to make a difference, not only for those in immediate need of assistance, but also to reduce the likelihood of future conflicts. The group brainstormed and met with political, business and religious leaders. By early 2007, we knew how we could make a difference. Children are the most helpless members of society and yet they own the future. If we could ensure every child in Lebanon received a proper education, we could impact the world they would live in. We could change the direction of this small country, with a population of approximately four million citizens and two million refugees. Although EOL has grown twenty-fold, we are still a small organization, but hope to continue expanding to provide assistance to the underprivileged Lebanese school children we serve. It began as a dream, but today, thanks to the generous support we’ve received, it’s a reality. Together, we’ve gone from helpless to helpful.